Based on a true story. When Abraham Lincoln is elected President, he brings only one friend to Washington: his banjo-playing, joke-telling former law partner and confidant, Ward Hill Lamon. Lamon is also large and handy with a gun, and when the first assassination attempt occurs in 1861, Lamon appoints himself the President's bodyguard. 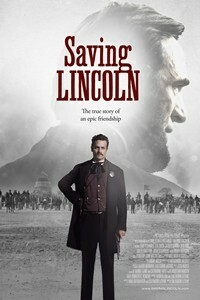 He serves Lincoln faithfully throughout the four years of the Civil War and from this unique perspective, Lamon witnesses every aspect of Lincoln's fiery trial as Commander-in-Chief, from the constant military and political pressure, to the personal losses of friends and family members. Lamon soothes Lincoln's tormented soul, saves him from repeated attempts on his life, and introduces him at the Gettysburg Address. Lamon is not present on that fateful night at Ford's Theater in 1865 because Lincoln sends him on a mission, yet it is Lamon who redefines that tragic event in a surprising and uplifting manner.